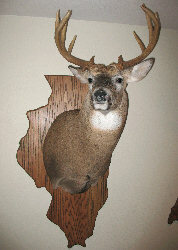 �A great addition to our After The Shot line of hand-crafted Trophy Plaques is our Shoulder Mount Plaques. 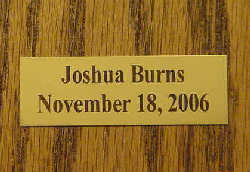 We offer our unique plaques in a size big enough for your shoulder mounts. �Made from oak, like all our plaques, they will compliment and add a distinctive touch to your trophies and your trophy room. �Specify the width you desire on the order form and we'll size the height accordingly. Some states may not look good or might not be able to be made in this style of plaque. 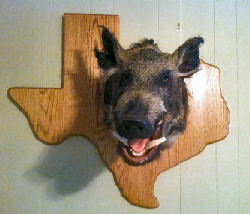 Contact us with any questions about your state at: sales@backwoodsbound.com. �All of our plaques are made to order, please allow up to 3 weeks for delivery. Longer for larger orders. �Due to the size of the box, the amount of packing material required and the time needed to safely pack and ship these plaques, there is a $35.00 Large Item Packing Charge per box on Shoulder Mount Plaques. Be sure to add Packing Charge to Shopping Cart. �Shipping Charges are quoted on a per order basis. The ordering system will automatically add the first $16.95 for shipping. You will be invoiced for the balance. Contact us with any questions. Thank you. Plaques shown: Illinois - 22" x 43, Texas - 37" x 33"
Add a gloss clear-coating to your plaque for Only $25.00!